Movie Review: E.L. Katz’s directorial debut is a noteworthy dark comedy and thriller, focused on Craig (Pat Healy), a recently fired and evicted family man who will embark in an unforgettable wild night with his long time acquainted Vince (Ethan Embry). While drinking at a bar, the two men will be tempted by a wealthy vicious couple, Colin (David Koechner) and Violet (Sara Paxton), who are prepared to pay them good money to enter in their strange games. Every task proposed by the capricious Colin becomes a fierce competition between desperate Craig and envious Healy, both losers in their own way, who start hating each other for money. It starts with drinking competitions at the bar, but soon the games degenerate into stupid suggestions and assignments, including sexual perversion and body mutilation. As the greediness increases, the game becomes more and more dangerous for the pleasure of the manipulative couple, eventually bringing tragic consequences. The electrifying ambiance created was perfect, reinforced by hypnotic music and great performances by the quartet of actors, especially Pat Healy who showed great acting quality. The plot, written by David Chirchirillo and Trent Haaga, has its dose of childishness but compensates with lots of fun and excitement, capturing all my attention throughout the time. 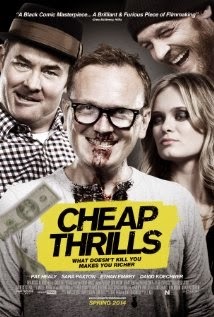 Demented, wild, and visceral, “Cheap Thrills” is a nasty silly game that I can’t understand, but is unquestionably hugely entertaining.